India’s brutal weeks-long heatwave has killed more than 2,000 people, authorities said Saturday, as the government launched a mass education campaign to help people cope with scorching temperatures. Hundreds of mainly poor people die at the height of summer every year in India, but this year’s toll is the second highest in India’s history and fifth most in recorded history globally, according to EM-DAT, an international disaster database. The southern states of Andhra Pradesh and Telangana — which have so far borne the brunt of the heatwave — accounted for 1,979 deaths. A further 17 people were killed in Orissa, eastern India, while nine people were reported dead elsewhere in the country, taking the death toll to 2,005. A total of 2,541 people died in 1998 due to extreme temperatures, the highest figure in India’s history, according to EM-DAT. Officials in Andhra Pradesh and Telangana, meanwhile, launched public education campaigns to inform the most vulnerable on how to withstand the heat. In Telangana, the authorities were using pamphlets and local media to inform people to avoid going outdoors and to drink plenty of water, the state’s disaster management chief B.R. Meena said. “The death toll stands at 489. There has been some relief in the heatwave also but we are out on the roads telling people how to stay safe,” he told AFP, adding that there had been no deaths in the state as a result of the hot weather since Thursday. His counterpart in neighbouring Andhra Pradesh, where 1,490 people have died since mid-May, said officials there had launched a publicity campaign outlining how to deal with the heatwave. “The deaths have definitely come down in the last few days,” state disaster management chief P. Tulsi Rani told AFP. 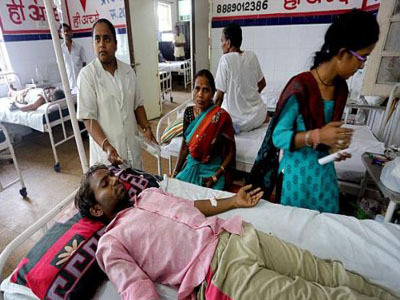 Health officials in Andhra Pradesh’s Prakasam district, where 305 people have died due to the heatwave, said the situation has improved in the last few days with few people arriving in hospitals with symptoms of heat stroke. 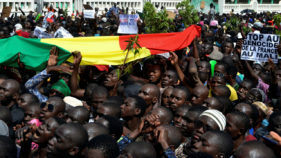 “There is no alarming situation at present. The heat has come down, and we’re seeing fewer new patients come in with heat stroke,” J.V. Subbarao, a top official at Rajiv Gandhi Institute of Medical Sciences, told AFP. On Saturday, maximum temperatures across India hovered around 45 degrees Celsius (113 Fahrenheit), with forecasters in New Delhi warning that searing temperatures would continue next week across several states. Hundreds of people — mainly from the poorest sections of society — die at the height of summer every year across India, while tens of thousands suffer power cuts from an overburdened electricity grid. The annual monsoon is forecast to hit the southern state of Kerala this week before sweeping across the country, but it will be weeks before the cooling rains reach India’s arid plains.